This dish to me is spring time on a plate. Between all the bright colors and the warming spices it just gets me so excited for sunshine and warmer weather. This dinner comes together rather quickly but packs a real flavor punch like it’s been cooking all day. 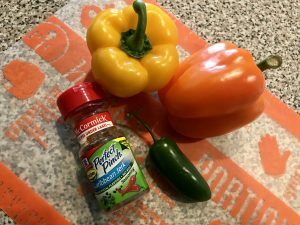 A short cut I love to use is this Caribbean jerk seasoning mix, the scent alone is enough to know something really tasty is coming your way. I’ve mentioned before eating the rainbow and this dish does just that. The array of different peppers and pineapple are not only colorful, but also delicious, with both complex flavors and textures. In a large skillet, heat 1 tablespoon oil over medium, medium high heat. Once hot, add in sliced chicken and 1 teaspoon Caribbean jerk seasoning, cook 5 minutes. Add in remaining 1 tablespoon of oil and 1 teaspoon of seasoning as well as your sliced bell peppers. Cook an additional 5-10 minutes until your peppers are soft. Now you’ll want to drain your canned pineapple, reserving the juice. Take 1/4 cup of the pineapple juice and deglaze your pan, stirring the chicken and peppers to get any bits off the bottom of the pan. Reduce heat to low to keep warm while you assemble your fajitas. 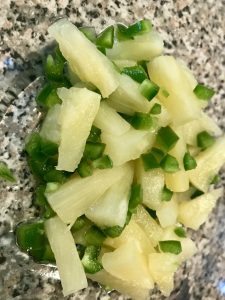 Combine the pineapple chunks with your jalapeño in a small bowl and set aside. Warm the tortillas, either in the over or microwave. 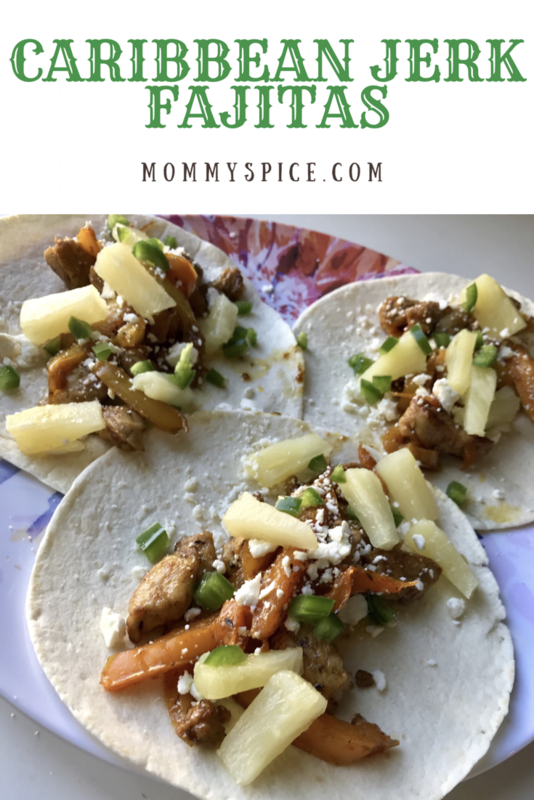 Now time to assemble, lay the warm tortillas down flat on your plate, put a big spoonful of the chicken and peppers down the center, top with crumbled feta cheese and a spoonful of your pineapple jalapeño relish. The finished product will be pretty as a picture and taste yummy too! A lot of people get scared off from fresh jalapeño, so if spice is not your thing feel free to leave that off. 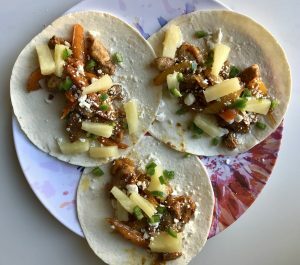 However, the heat from the jalapeño and the sweetness of the pineapple play really nicely off each other, then the creaminess of the feta just really brings it all together. 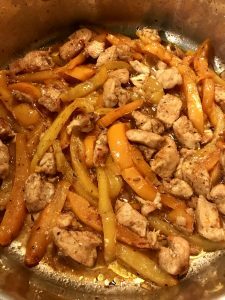 My tip for this one is to slice your chicken a little smaller than your bell peppers, the bell peppers do shrink up a good bit and in a fajita it’s nice to have everything be around the same size. I also usually like to cut the pineapple chunks down a little bit as well for this same reason.